This post is Part 18 of a series to augment the Atlas of the Known World available for free download. Start with Part 1 here. This and other mapped regions are gathered in my Map Directory for you to explore. Realm of generals and legendary daemons. You voted The Eighth Hell runner-up of January 2016 by 23%. Vote for Best Map today or Nominate Maps for future votes! 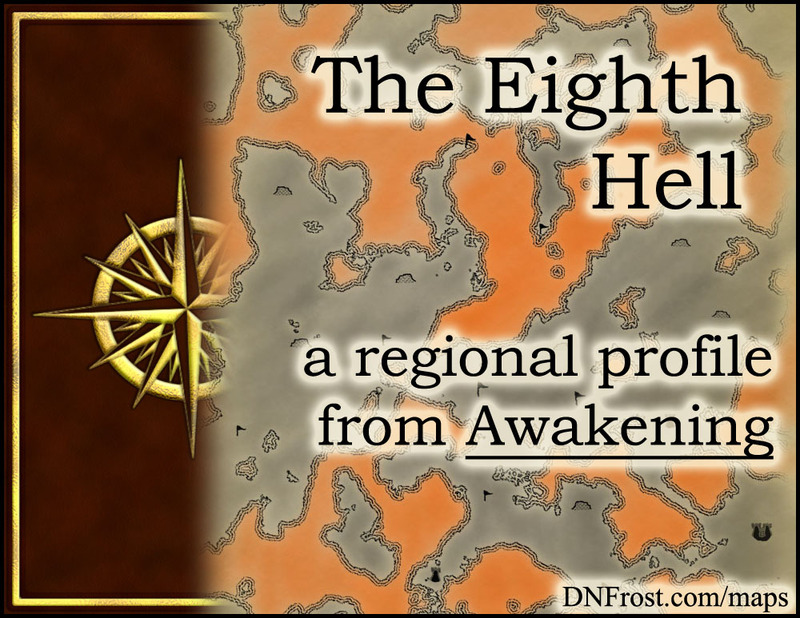 In Chapter 13 of Awakening, the Eighth Hell is the first of the deified regions of the Nine Hells. It lies just above the Ninth Hell, and its elevation ascends into the Seventh Hell, where sentient daemons live. Cloaked in eternal darkness, the Eighth Hell is caustic and sweltering, lit only by fire and the churning pits of lava beneath its sheer cliffs. Great stretches of molten rock isolate the outlying hunting grounds, whose towering cliffs do little to deter the hungry. This region also borders the Fifth Hell, the Fourth Hell, and the Third Hell. Check out this Atlas of the Known World for even more maps! Desolate rock offers no hope for plant life in the Hells, and there are no animals native to the Eighth Hell. The daemons of the Eighth Hell are all sentient and unique, revered as demigods throughout the Hells and often legendary within the Known World. Their deity, known as Father, dwells in the Black Citadel of the Ninth Hell, and they serve him with undying loyalty. In times of war, they act as his commanding generals. Like all daemons, those of the Eighth Hell split in two each night rather than procreating. While daemons of the Eighth Hell do not prey on the ascended mages of the nearby Seventh Hell, they do hunt the frail mages of the Fifth Hell. Denizens will also feed on non-sentient daemons from the Third and Fourth Hells, but the higher cliffs make these hunts more arduous, and the easy prey is less rewarding. The legendary daemons of the Eighth Hell care little about clothing. It is generally found inconvenient, especially since it doesn't split in two along with the daemon wearing it. However, clothes crafted with hide or hair of certain quality may retain the necessary blood magic to split in two with the wearer. While denizens of the Eighth Hell are the highest-ranking daemons in the Hells, they do not bother learning how to create lasting clothes. However, certain daemons have received gifts of clothing as offerings from reverent lesser daemons, and these creatures may still be wearing their clothes today. Instead of the life magic that forms the physical foundation of the Known World, the realm of the Nine Hells is founded on blood magic. Blood magic is little seen and hardly understood in the Known World, giving rise to the notion that it is evil magic. While there are daemon scholars in the Nine Hells who have studied and categorized blood magic, the revered denizens of the Eighth Hell are not among them. Daemons of the Eighth Hell are each unique, and each of them has a unique blend of blood magics unseen in any other daemon. While each daemon is extremely skilled in its own magics, most do not take the time to develop their skills further, nor do they try to learn new magic skills from other daemons. Check out this Magic Codex of the Known World to learn more! Life for daemons of the Eighth Hell is dominated by religious devotion to the deity Father, and by daily combat to the death in his name. The Eighth Hell is the last domain between Father's realm and the lesser Hells, and its denizens take their charge of protecting the Black Citadel very seriously. Countless devotees from lesser Hells embark on lethal pilgrimages to return to Father, and the daemons of the Eighth Hell must thwart all but the most worthy of pilgrims before they reach the final gate. Those deemed fearless enough, violent enough, and faithful enough pass the Trial of Devotion and are allowed through the Eighth Gate. Beyond, they'll entreat the greatest privilege imaginable: to die upon Father's table and be consumed by the creator himself, thus returning to Father in the most literal way. As Father's last line of protection from the unworthy, the denizens of the Eighth Hell are loyal, incorruptible, and absolute. Those who fail the Trial of Devotion count themselves lucky to die so close to the Black Citadel. The most unworthy of supplicants are turned away alive, denied the precious gift of death that Father extends to all his faithful. The pain of this denial is extreme, and the daemons believe that through enduring this pain, a supplicant can be purged of past unworthiness. Sometimes, great physical injury is also inflicted upon the denied, and this bodily harm is understood as a kindness, heightening the pain of the denial and hastening the purge of unworthiness. Daemons rarely survive these injuries, and their eventual death is considered the sign of Father's gracious reprieve. The daemons of the Eighth Hell are the most devout and pious of all the Hells, which means they are the most violent. In the name of Father, they hone their battle skills constantly, splitting in two each day and fighting their identical twins to the death. Often, they devour the vanquished to save time, though quick victories can result in lethal hunting parties. This continuous battle does honor to Father, setting an example for the lesser Hells by demonstrating their utmost dedication to warcraft and the art of sustainable living, which are considered nearly synonymous. Throughout the lesser Hells, elite clans of warrior-priests emulate the lives of those in the Eighth Hell by waging war on each other. Induction into these elite clans includes battling one's twin to the death, and ceremonial banquets honor the fallen by serving their flesh to the living. Regional languages abound throughout the Nine Hells, but the denizens of the Eighth Hell have abandoned their local dialects in favor of T'spfk'gt'x, the language of Father himself. As a unifying tongue for all the Hells, T'spfk'gt'x has no vowels at all, allowing even those daemons without vocal cords to speak it. The language's name translates to Of the Winged Ones, and it sounds like a crush of hissing consonants to a speaker from the Known World. While the daemons of the Eighth Hell are not well-versed in reading and writing, they are adept in the range of military whistles used to issue commands to troops. Ironically, whistling in other contexts is exceptionally degrading and vulgar, though daemons of the Eighth Hell are so high-ranking that they rarely suffer any consequences. Check out this Language Codex of the Known World to learn more! In the book Awakening, Jorn is a runaway slave reluctantly embroiled in the fate of the world. Through the course of his strange destiny, Jorn's soul is torn from his body for a disturbing excursion into the Eighth Hell. There, he is forced to watch the epic battle of twin Minotaurs for hours on end. Jorn is eventually reunited with his body, but the horrific trauma of his experience lingers as he works to unbind the mythic city A'lara for masters new and old. You can download Atlas of the Known World here, or start your adventure below.